Mara Mugs make great gifts. There are stoneware mugs and cups then there are Mara Stoneware Mugs. "Ceramica Mara Productions" have produced over 200 uniquely designed stoneware mugs and cups. Anyone would enjoy drinking their favorite cup of coffee or tea in one of her mugs or cups. The flowers, birds and geometric designed mugs all represent her personal vision and display her unique perceptions of the world. Remember the gift of Mara stoneware pieces conveys to the person receiving the gift that they are very special as stoneware will last for years while keeping its original beauty. This tells that person that their relationship with the gift giver is special and will be for years to come. All Products are Dishwasher & Microwave Safe Except Our Trivets Which Have a Wood Backing. When looking for that special gift for a loved one or friend you have many choices in our Mara Mug collection. Mara 16oz Round Bottom Mug collection alone offers over 114 uniquely designed mugs to choose from. Mara 12oz Square Bottom Mug collection has another 65 uniquely designed mugs to check out. As you will find out you can personalize your gift easily with just a few clicks of the mouse or enter a theme key word in our search box and see what pops up. The reason Mara mugs are so special is they are made of a very durable material, stoneware. Ceramica Mara production's stoneware mugs are fired twice at high temperature and finished by hand, giving each stoneware mug its own characteristic. Their stoneware mugs are very durable with a large handle so you can securely hold your mug of coffee or tea. Stoneware Standard is proud to offer stoneware dinnerware from two very experienced ceramicaist Mara and Prado. "Ceramica Mara Productions" offer you 13 unique designed stoneware dinnerware sets to choose from. One example Mara Stoneware Dinnerware Set-Animals is unique in that all pieces are totally different and artistically designed with the animal theme. Another example Mara Stoneware Dinnerware Set-Horses is one of the favorites. In this 16pc dinnerware set - horses designed by Mara, look at how she has artfully done the horse's mane. These are just two examples of the 13 Mara Stoneware Dinnerware Sets we offer. If you are really looking for a very unusual set of stoneware dinnerware, then take the time to look through each of her designs. We also offer many complement pieces to go along each dinnerware set. Prado offers Square Stoneware Dinnerware Sets in 5 vivid colors that will brighten your dinner table. Also check out his complement pieces that will make your dinnerware set complete. Who knows what will capture your got-to-have-it button. After all, it is each individual's own taste in art and design that makes life interesting. Stoneware Dinnerware is very expensive and should be considered as an investment. As an investment you want to look at how long the product will last. Stoneware Dinnerware is extremely durable with the minimum of care and will give you many years of enjoyment at the dinner table for your everyday meals or that special occasion. Each piece is fired twice at a high temperature and finished by hand. Padilla Mug Tree Sets show a most unusual drip-looking glaze on his stoneware mugs with an attractive wooden tree to hang his different sizes and shapes of mugs on. 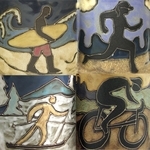 Padilla, through his artistic abilities, has sculpted some unusual stoneware mugs which feature a picture of different designs, Padilla Raised Design and Kokopelli and also show off his unusual drip-looking glaze. Some of Padilla's other designs have distinctive shapes. These stoneware mugs make a great gift for someone who likes something out of the ordinary. If you are looking for unique Corporate Gifts.you are in the right place. For that special executive gift check out these items Mara Limited Edition Pieces. These items include numbered certificates of authenticity and are packaged in a designer box for gift giving. They are truly collectible art piece. We also offer many other excellent Corporate Gifts such as our Mara Beer Steins 16oz & 15oz Sculpted. our Mara Stoneware Pitchers and our Mara Stoneware Teapots . Then of course for the multiple Corporate Gifts we have our famous Mara Stoneware Round Bottom Mugs and the Mara Stoneware Square Bottom Mugs. And also the unique Zodiac Mara Mugs 16oz. Another selection for the perfect Corporate Gift is our Padilla Stoneware Mug Trees these are 13 unique Stoneware Mugs by Rodolfo Padilla who has mastered the technique of high-fired ceramics, Padilla's process includes firing the piece at high temperatures, letting it dry for a couple of days, removing the rough edges and then applying a lead-free glaze creating the appearance of it dripping before firing it again for a shorter period of time. They come in up to 15 vivid colors. 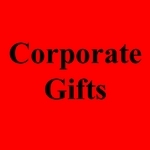 Finally her are more Corporate Gift ideas for you to select from. They are Prado Unique Stoneware Products. Of course we encourage you to check out all of our selections that might interest you in your search for that perfect Corporate Gift.